Q. Why should we buy a pool from Blue Haven Pools? Blue Haven Pools are the biggest pool builder in Australia by a large margin. Our closest competitor, in volume, would turn over only half the amount of pools that we do. 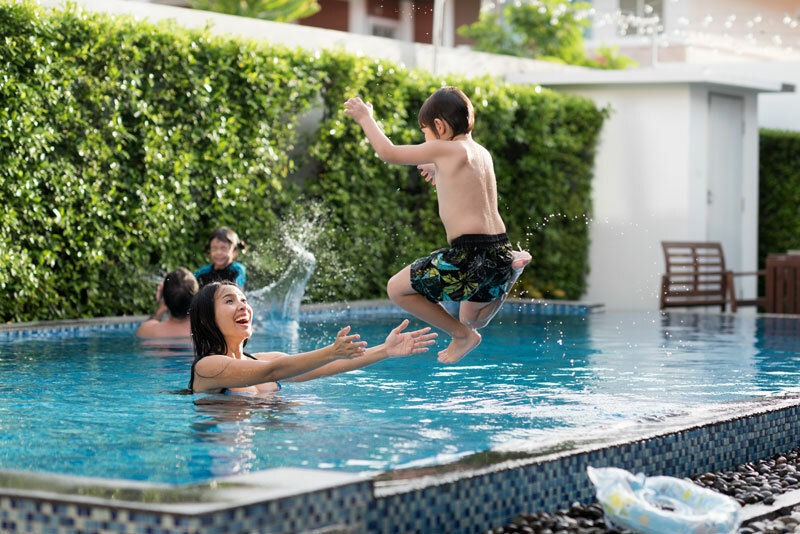 Because of the volume of pools, we turn over, our buying power is huge, and we are lucky to be able to pass on the benefits of our buying power to our clients, both regarding cost and materials selection. We can build an economical pool but still include all of the quality finishes that our clients envision in their design. Overall, the reason you should trust Blue Haven to install your pool is that we’ve been in business for over 40 years, and in those 40 years we’ve gained the experience, the buying power, and highly-satisfied customers that make for a dependable, highly reputable pool builder that strives for excellence on every one of our pools. Q. Is it cheaper to buy in summer or winter? We always strive to be very competitive in the pricing market. At the same time, the people who are supplying our materials may increase their costs during a particular time of year. However, as mentioned before, because of the high-volume of pools we build, our buying power is strong. This means that price fluctuations throughout the year tend to have only a slight impact on the overall cost of our pools. The best advice we can offer is that whenever you are thinking of building a pool is the right time to build. Perhaps the entire reason you are looking into a pool is that you’ve finally found the time to do so! Why not capitalise on that time to focus on making sure you achieve the pool of your dreams? All in all, a swimming pool is for you and all of your friends and family to enjoy, and the sooner you are swimming, the happier everyone will be. That’s what makes every day in the pool feel like a holiday. Q. Who installs all of the pool surrounds? Due to the size of our company and buying power, we have the expertise and resources to fulfil most customer requests, including pool surrounds. If you’d like us to complete all of your surrounding landscaping, we have the ability to do so. If you’d prefer to install your pool surroundings on your own or work with a landscaper, we are happy to provide any information about the swimming pool design that is needed for you to plan the surrounds. If you’d like to use Blue Haven for your pools surrounds, we’ll discuss planning for the surrounds with you and make sure we understand exactly what you are looking for regarding landscaping and design. We have designed surrounds on many of our pools including decking, retaining walls, planter beds, plant selection, and fencing, to name a few. Once we have an understanding of what you are looking for, we can design a package to best suit your needs for the pool and its surroundings, and work all of the details into the contract.